Project V8 RX-7: Part 7 – Bringing the E-ROD LS3 to Life (Almost)! Now that we've checked “mount the engine and transmission” off our E-ROD LS3 swap checklist we can turn our attention to all the little things needed to get our RX-7 on the road. What's left? We need a fuel pump, cooling system, shifter, driveshaft, exhaust and we still have all the wiring left to do. In this episode, we figure we can tackle the fuel and cooling systems as well as the wiring before we put you to sleep. Let's get to work! We begin with the fuel pump, of which the E-ROD kit does not come equipped. This is actually a good thing, because if it did–being a California smog legal kit–that would be the only pump we could technically use. So the choice is up to us! 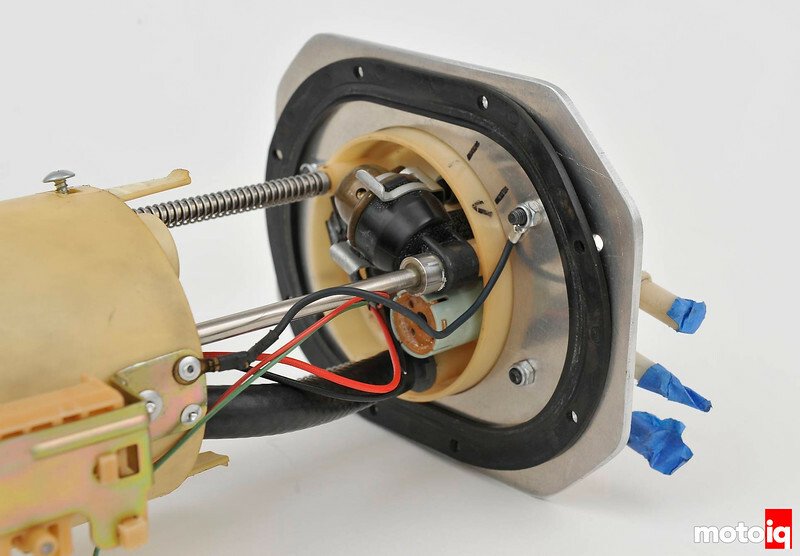 Had we started this project with a stock RX-7, the simplest way to fuel our E-ROD kit would be to modify the RX-7 fuel pump assembly to accommodate a higher capacity pump and then add a non-adjustable 60 psi fuel pressure regulator needed for the LS3. Unfortunately, we’ve already thrown out our old RX-7 pump assembly. Remember we had an LS1 in our RX-7 prior to the E-ROD and to earn CARB approval on the old swap we had to use the same fuel pump, regulator and carbon canister that came from the donor vehicle—in our case a 2001 Camaro. For us, the easiest option was to modify the Camaro fuel pump assembly we were already using. The good thing is that old LS1 pump assembly already has the correct in-tank regulator we need and we’ve already mounted the stock RX-7 fuel level sender onto it! 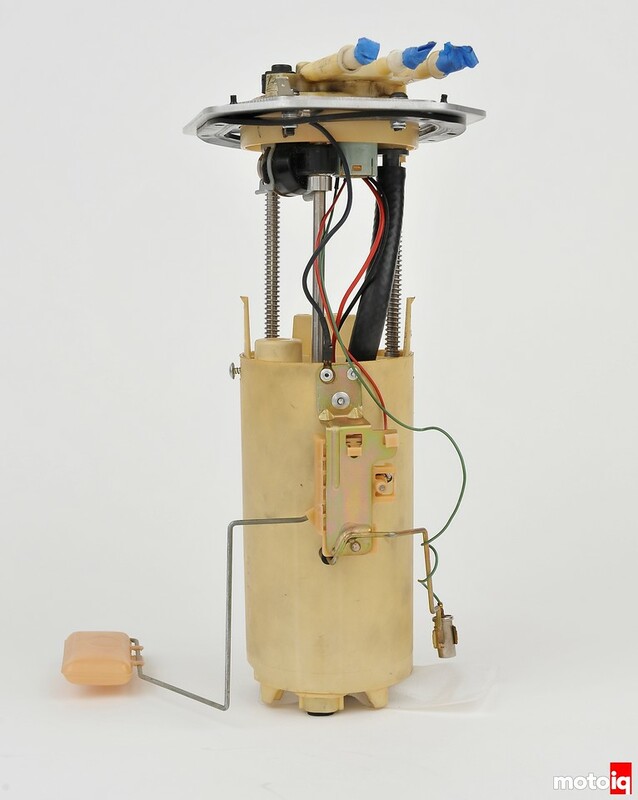 The stock Camaro fuel pump assembly we'll be using to fuel our E-ROD LS3. The Camaro fuel level sender was removed and replaced by the RX-7's stock sender seen here riveted to the side. On the underside of the top of the fuel pump assembly is the stock Camaro in-tank fuel pressure regulator.